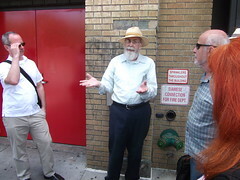 This past weekend, the Lower East Side Preservation Initiative hosted a walking tour of the long-gone Jewish Rialto, formerly one of the preeminent theater districts outside of Broadway. The marquees touting lively music, comedy, and burlesque acts are no longer aglow, but during the three-hour stroll, theater historian Cezar Del Valle noted architectural remnants of the Yiddish theater era’s early-1900s heyday. 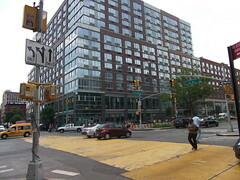 The district was ample, stretching from Second Avenue to Avenue B, and from Houston Street to 14th Street. Smaller stages nestled on side streets also hosted Jewish, Shakespearean, and original plays, as well as vaudeville, burlesque and musical shows. Beginning at 143 Houston Street, Del Valle opened the tour with the story of the Houston Hippodrome, which was “a wooden ‘worm eaten building'” and a German evangelical church in the late 1800s until the General Slocum steamboat disaster in 1904. The Minksy family of real estate investors funded a reconstruction and in 1909 the space reopened, “presenting movies and vaudeville. Short plays were added circa 1912,” said Mr. Del Valle. It’s now the home of the Landmark Sunshine Cinema. Kevin McLaughlin The site of the National. “The Yiddish or Jewish Rialto dominated the culture and history of the Lower East Side for much of the 20th Century,” said Mr. Del Valle, author of the two-volume “Jewish Theatre Index.” “Many of its stars would go on to Broadway and Hollywood.” Jacob Adler was one such local success; the star of Yiddish performances in the early 1900s, he ultimately landed both a career on Broadway and a lasting legacy through his daughter Stella, whose Stella Adler Studio taught method acting to the likes of Marlon Brando, Robert DeNiro, and Candice Bergen. 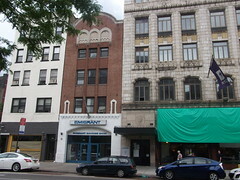 In 1913, construction of the National Theater, at 11 East Houston Street, was funded by the Minskys; it became a social club for burlesque performances and was renamed the Roosevelt Theater in the 1930s. It’s now the site of Whole Foods. Kevin McLaughlin Former site of the Majestic. 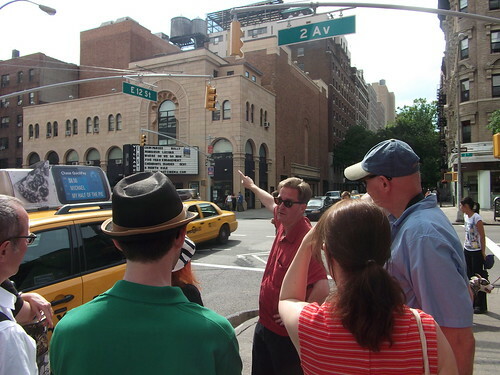 Along Second Avenue, Mr. Del Valle led the tour past now nondescript, if not non-existent, former theaters that began to fade with the onset of the Great Depression. Between Houston and First Streets, a conspicuous construction site stands in place of the leveled Majestic Theater. The Loews Commodore, which opened in 1926 and hosted Yiddish performances and films, eventually became the Fillmore East and The Saint nightclub, and is now the Emigrant Savings Bank. 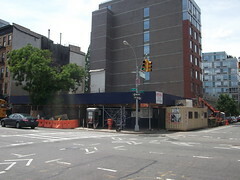 Next to the bank, the original home of Tisch School of the Arts, at 111 Second Avenue, was formerly a concert hall which housed jazz concerts for Billie Holiday and orchestrations by Billy Crystal’s father, Jack Crystal. In 1904, the Orpheum Theater, where “Stomp!” now runs, delighted the local Austrian community with its “Tinkle-Tankle,” in which an actor comedically impersonated Viennese characters such as policemen, cab drivers, and peddlers. At 12th Street and Second Avenue, the building that houses City Cinema Village East still closely resembles its former incarnation as the Yiddish Arts Theater, which opened in 1926 and hosted shows put on by Maurice Schwartz, including a 300-performance run of “Yoshe Kalb.” The main screening room, with its majestic ceiling bearing a painting of the Star of David, is currently under restoration. At one point during the tour, Herbert Latner, a child actor during the late 1950s, shared stories about George Gershwin, who assisted with theater compositions while living in a modest apartment on Second Avenue, and Walter Matthau, who enjoyed a brief career as a concession-stand cashier. A candid and gregarious figure, Mr. Latner continues to promote the lively cultural spirit through gatherings of the Yiddish Artists and Friends Actors Club on Seventh Street; these meetings are occasionally emceed by Fyvush Finkel, whose name is etched on one of the marble stars along the Yiddish Walk of Fame on the sidewalk of Second Avenue, near 10th Street, where the Second Avenue Deli once stood. Next post Street Scene | T.J. Meets E.V.